Over the summer, my colleagues and I trained 465 Preschool-12 grade teachers on activities and strategies using Chromebooks. Our focus was not about the tech, not about the programs, not about the apps. Our focus was on the pedagogy. I, personally, have taught K-4th grade and really had a hard time wrapping my mind around how to effectively implement this for our littlest learners. Luckily, on Twitter, I came across #GAfE4littles and Christine Pinto. I suddenly saw the possibilities, but it was still quite abstract to me. Through a whirlwind set of communications and stars lining up, we were able to bring both Christine and Alice Keeler out to our district. 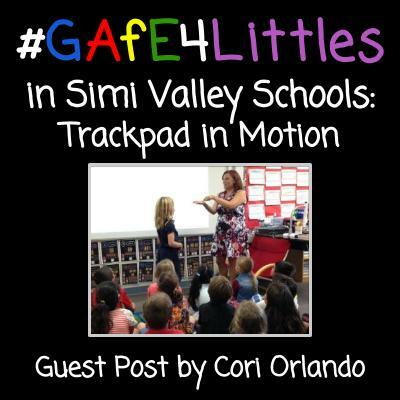 On August 12, 2016, the Friday before school started, 50 JK-3 Simi Valley Schools’ teachers attended a #GAfE4littles workshop. The day was incredible! The energy, the hope, the appreciation among our teachers was infectious!!! 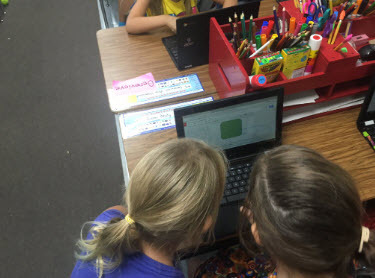 The students had already pinned Google Classroom to the shelf of their Chromebooks. They were already in their Google Classroom before I could finish giving them the directions. On the rug and we danced and sang to Dr. Jean’s “Insect Song” to learn the vocabulary. Even our Assistant Supt. of Ed Services Hani Youssef joined the party. They joined me back on the rug and I explained the assignment. 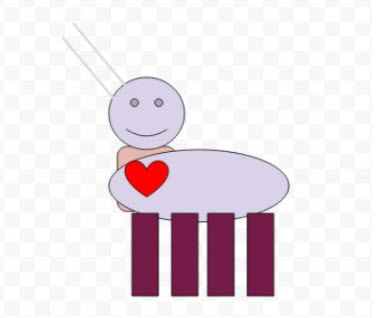 They would be creating their own insects (oooh, ahhh).– On the screen I modeled how to grab a shape, drag and drop it. I showed them that before you can move it, there needs to be a + on the shape. I moved my cursor around and every time the + showed up, I had them make a + with their arms.– Next I had them repeat after me “Click and drag. Click and drag.” While talking about the trackpad, we talked about frustration and the fact that I know many adults that would get frustrated with it. 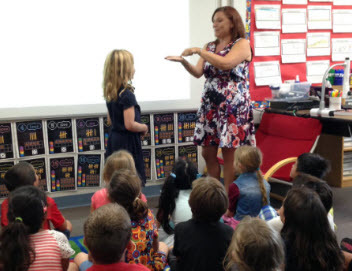 We talked about grit and perseverance (yes, in first grade). What is grit? “When you just keep trying?”. We talked about mistakes and that they are okay (the back arrow is our friend!). We also talked about the fact that our creation won’t be perfect and that’s okay…we should be proud because we made it, we own it.– I then stood in front and showed them “Click and drag” with my fingers. They copied and repeated “Click and drag. 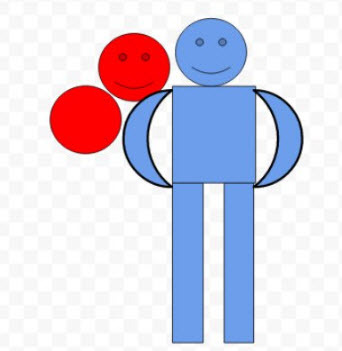 Click and drag.”– Next I brought up a volunteer to “be my shape”. When she made a + with her arms, I did my “click and drag” and she moved accordingly. *Lots of giggles and excitement. 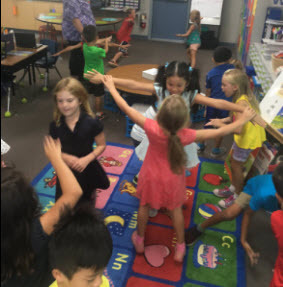 – The students then worked in partners practicing moving each other with “click and drag”. They then had 5-8 minutes to practice on their Chromebooks. 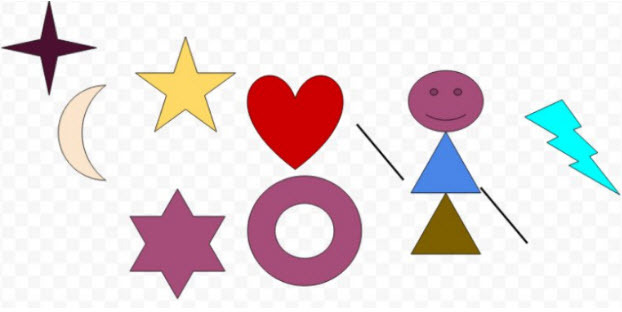 A student figured out how to add other shapes, so he came up and showed the class. At the end, students came up and shared their creations. We celebrated them and when we saw something new, they explained it to the class. For example, a student figured out how to type text and manipulate it to go diagonal! Did they end up creating insects? Mostly, no. But that really doesn’t matter. If I were to do it over, I may have gone more open ended with this first one. But they didn’t care that their creations weren’t insects, they were just so excited. This smile says it all!! To me, that was my goal! The “overt skills” I wanted them to learn: using the trackpad to manipulate shapes. The “covert skills” were those soft skills: grit, perseverance, the 4Cs: critical thinking, communicating, collaborating & creating. 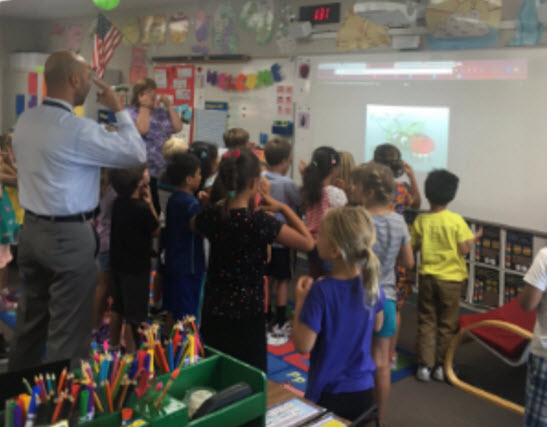 Those are the skills that these first graders will need and use for the rest of their life. What naturally happens, in a classroom where these things are valued (Thank you Gena!) is students work together. 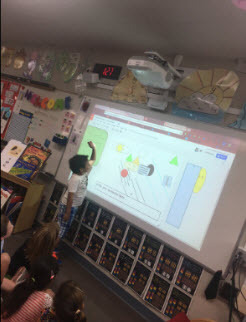 I showed two students how to delete a shape and they became the expert and showed others. When students saw something on a screen that they liked, they simply asked “How did you do that, can you show me?”. Students were sharing screens. At one point there were six little heads in front of one screen. To me, this is magic!! 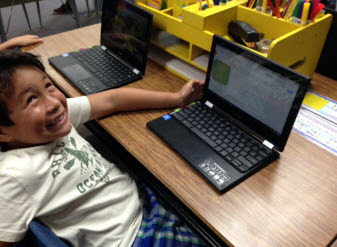 This entry was posted in Chromebook, Digital Literacy by Christine Pinto. Bookmark the permalink.